Boston DevelopmentsThe Herald published a short article on the status of several Boston real estate developments. Some I've reported about here and others are projects that have yet to break ground. Three condo developments that are selling well border the South End and Back Bay. The Clarendon, Columbus Lofts and The Bryant. 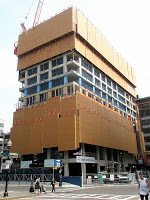 The Clarendon is the tall concrete structure that's now a part of the Boston skyline, and as noted in the Herald, is having a topping off ceremony this week. This photo is from several months ago, but it should allow you to identify which building I am referring to. Last updated April 25 at 3:40 pm.